Perfect for making bends and coils in wire. 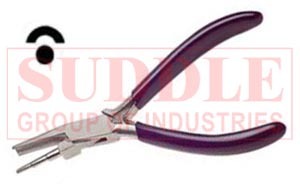 Stainless steel with a concave jaw for easy bending and a round jaw with 3 steps: 3.0mm, 4.0mm, 5.0mm. 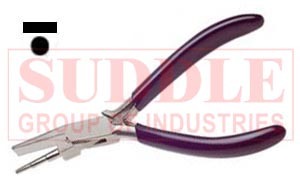 These pliers feature a box joint, leaf springs, and PVC coated handles. 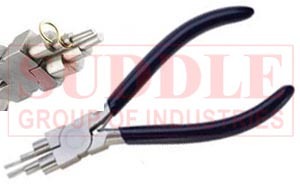 Perfect for making bends and coils in wire. Stainless steel with 7.7mm flat jaw that tapers to 4.7mm and the round jaw has 3 steps: 3.0mm, 4.0mm, 5.0mm. 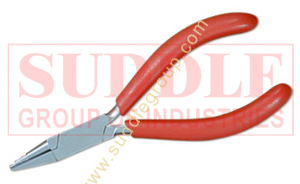 These pliers feature a box joint, leaf springs, and PVC coated handles. for a variety of combinations. Made of stainless steel with double leaf return springs.